Open up. 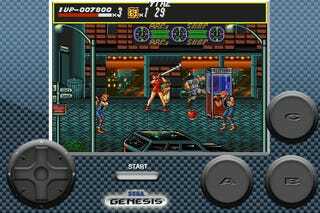 Time for your weekly dose of "let's port a game to the iPhone for a quick buck", this time featuring Sega, and a re-release of Streets of Rage. The game was released on Friday, and is going for $5 on the App Store. As is standard policy with these things, I'm not touching it until somebody braver than I spends $5 and can tell me the controls can't be convicted of hate crimes against a Genesis pad.